Various EMI specifications require the injection of high level voltage or current pulses and the reception of low level voltage or current emissions using a toroidal transformer or coupling device around the interconnecting conductors of the subsystems/equipment being tested. The Solar Type 9335-2 Multiple Impedance Coupling Clamp is a split toroid, designed as a versatile impedance matching transformer used in conjuction with a generator as an injection probe for conducted susceptibility tests such as methods CS10 and CS11 of MIL-STD-462, Notice 5; CS116 of MIL-STD-462D; DO-160G, Section 22, other specifications. INJECTION – High power transient generators with source impedances from 0.25 Ω to 50 Ω can use this probe to deliver high peak voltage or high current pulses into the wires or cables passing through the window of the device. 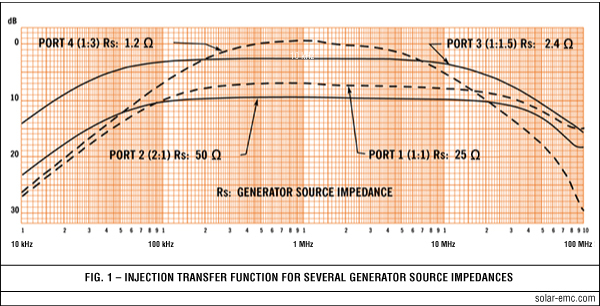 The unique winding arrangement of this impedance matching probe* provides step-up or step-down ratios with respect to either: 1) the source impedance of the connected generator, when used for injection, or 2) the load impedance of the connected receiver, when used for reception. This results in maximum power transfer into or out of the transformer winding formed by the cable bundle passing through the window. These ratios are selected by connecting to one of the four BNC connectors on the side of the Type 9335-2. Figure 1 shows a family of curves representing the transfer functions for each connector port when the device is used as an injection probe. Through connector port selection, the open circuit voltage or short circuit current can be adjusted for maximum transfer of energy. This is especially useful as an accessory to the Solar Model 9354-2 Transient Pulse Generator with its differing source impedences, enabling it to meet various open circuit voltage and short circuit current requirements. 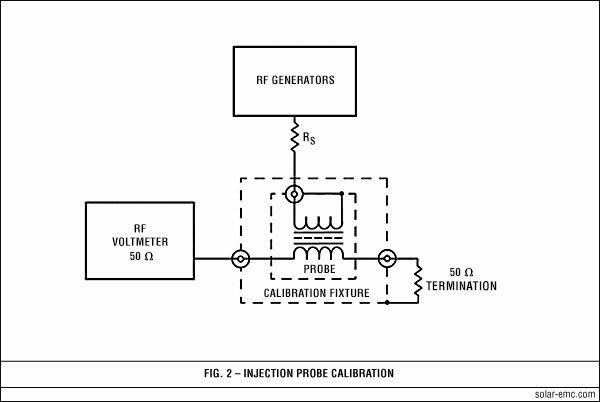 For proper calibration of current probes, a special test fixture must be used to maintain a 50 Ω characteristic impedance for the test signal as it passes through the window of the probe. The design of the Solar Type 2925-1 Calibration Fixture was carefully tailored to provide a 50 Ω characteristic impedance based on the specific dimensions of the Type 9335-2. The fixture maintains a low standing wave ratio from 10 kHz to 10 MHz in a 50 Ω circuit. 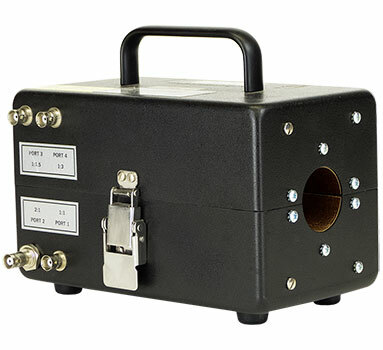 * We refer to this unique device as the Knoller Probe, since it is the brainchild of the late Hank Knoller, an EMC engineer with more than forty years experience in the design and application of equipment for EMI testing.